UberChic Beauty just released something new, something that we haven't seen before, and something that's called uber. But is it? Time to find out, here's my review of the Uber Mat! As you might know, I use a placemat to polish on and to protect my desk. It's a sturdy plastic thing, and I have it on my desk most of the time. It protects my desk, I can check out how a design would look by simply polishing/stamping it onto the placemat, and I can use it for things like gradients. I can also clean it along when I clean my desk, and place (hot) food and drinks on it. The downsides? • It isn't acetone-proof, the aceton dries out the plastic, which makes it curl up, hard and wonky. • It can get stained easily (probably thanks to the acetone as well), and it's nearly impossible to get it fully clean after a while. It still does the trick, but a smudged placemat just doesn't look so nice on my desk! • The placemat is so smooth, I use my keyboard to keep it in place on my desk (yes, my keyboard also gets some polish and acetone on it at times, my previous one looked like a mess eventually >.<). But sometimes it still moves, and my desk does get at risk for polish at times. • I can't make decals on it. • I don't think every plastic placemat will be suited for this, not all plastic reacts equally well to acetone. When it gets all curled up and smudged, I usually replace it. It takes some time though, so all in all it's a cheap option that worked for a long time for me! Then about the decals and reversed stamping. I recently started with making stamping decals and reversed stamping designs (simply put, you get a design on your stamper, color it in, and seal it with top coat to create a 'sticker' that you can glue onto the nail with a little top coat), and I quickly found out that it takes a LOT of time to create a full mani when you only have 1 stamper! So I ended up buying a few more, but there's another downside about the stamperhead decals for me. The stamperheads are usually a bit rounded, and the finished decal will be a bit curvy too - in a different way than my nails are! 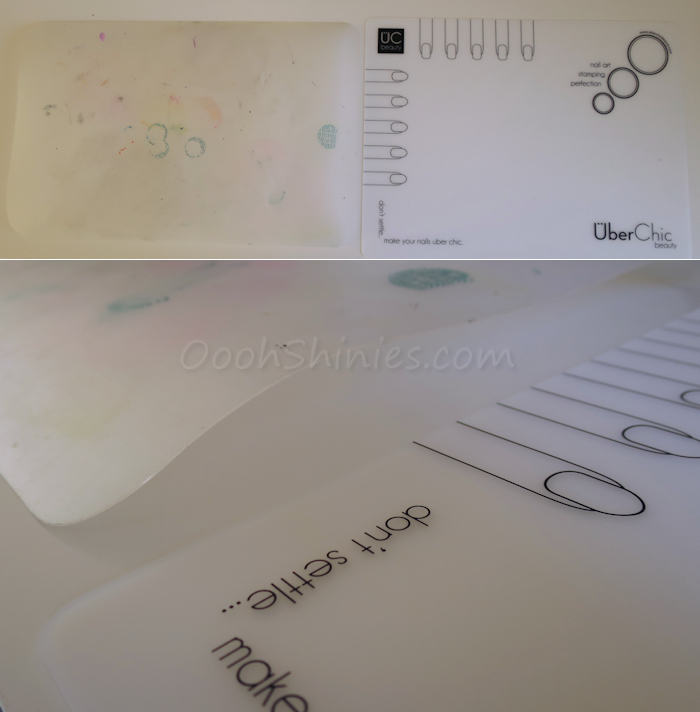 You can also use things like a ziplock bag, ovenpaper or a silicone baking tray, but the first 2 options are a little messy in my opinion, the silicone baking tray is something I've never tried. It's a technique that's been around for quite some time, but only recently really started to get used a lot with the use of stampers, so I guess I'm not alone on considering the other options messy! Now, let's have a look at the mat! It's a nice size mat, a bit smaller and a bit higher than my placemat. It's 40.5 x 30.5 cm (16 x 12 inch). And it sure looks a lot better! :D It feels nice, like very soft rubber, but it isn't sticky (like some stampers are). The bottom is just a little bit coarser, and even though you can fold it and roll it up, when you put it down it stays in place! The nails on the mat are squoval and rounded, and their size is around 2 x 1.1 cm, which is pretty much the length of my thumbnail. You can of course also create decals on other parts of the mat, or just polish outside the nail outline to make it bigger, but for me it's a perfect size to get an idea of how something would look on my nails! Fold, roll, crumple, the Uber Mat has no problems with it! Here's how my current placemat now looks, and yes, it's thát curled up from the acetone. I'm sure it's clear which one I prefer to work with and look at! • Decals/reversed stamping of course! The Uber Mat will ever so slightly curve upwards where you apply your polish, so your decals aren't 100% flat, which I think is a nice extra touch. Not as curvy as the stamperheads, just a hint of curve to match easier with the curve of your nails, and it's not rounded like the stamperheads. It's subtle enough that I couldn't capture it well (sorry about that!). For today's mani I started with 2 decals and planned to use them as accentnails. I maybe should've left it at that, but I really enjoyed working with decals on the mat, and went for more of them :) Here's how it looked after coloring the first 2, what a mess! ^^ This was top coat, a very fine-lined image stamped in black, and colored in with a dotting tool. As you can see, I use plenty of polish when coloring, to make sure I don't smudge or pick up the stamped design while coloring. You can see further down how it looks on the other side, on my nails. • Glitter polish. Sometimes you have a beautiful, sparkly polish and it just won't stop devouring your top coat, ugh! What happens if you apply it to the mat, let it dry and then turn it around, will that side be smooth and not eat top coat? It would be somewhat of a mess to get 10 glittery nails like that, and will take you some time, but is it an option? The answer is... nope! Aww. Shown here is one of the biggest top coat eaters that I could think of right now, Nubar Violet Sparkle. So pretty, but such a hassle to get smooth! I applied 2 coats to the Uber Mat and let it dry, then I peeled it off and turned it around, and yes, the bottom was very smooth. It looked like mattified glitters. So far so good! Then I top-coat-glued it onto my nail with the coarse side down and applied top coat on top, but that quickly sank in, bringing out the coarse glittery look and the result was that I still needed more top coat. Having said that, you can still use sparkly decals like this to create an easy accent or bigger part of your mani, like a stripe of glitter (just cut the decal into strips) or a diagonal half glittery nail! Or maybe glitter splatter decals? This photo might look a bit strange, but what you're looking at is my hand under the mat. Just a slight movement of the mat and the whole thing comes off so easily! However, I'd advise you to use a tool to pick the decal from the mat, because if you have more decals on your mat, those will come loose as well if you move the mat. • Lint roller cleanup. You can easily clean your stamper with a lint roller or simply a piece of tape, which doesn't work with my placemat, but it does work on the Uber Mat! This was something I was curious about and I'm glad to see it works, no need to make a mess of those oh-so-pigmented stamping polish remains, just let them dry and pick them up with some tape or a lint roller. 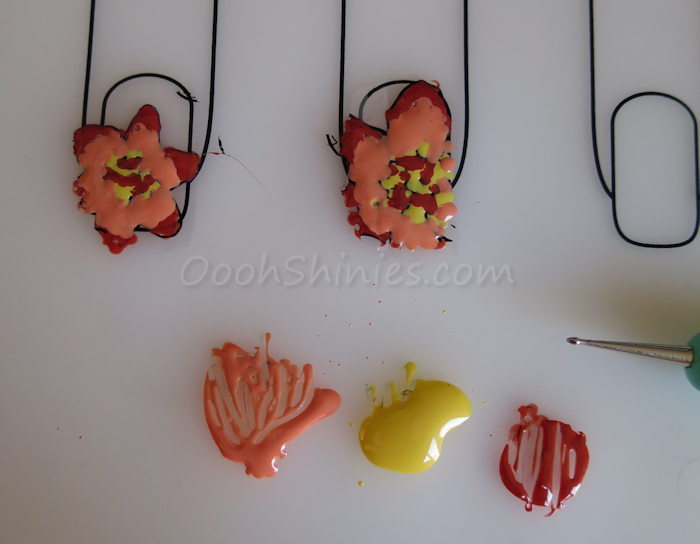 It also works with blobs of polish (remains from coloring decals), again, just let them dry and roll them off your mat! • Clean it. Since my mat is almost always on my desk, I prefer to clean as well when I'm cleaning my house. The mat seems to have no issues with this, so that's an added bonus. Please note though, I'm not sure how the mat will react (in the long run) to those chemicals that aren't polish or acetone, this is just me testing out something that I used to do with my placemat! • Use a tool to pick up your design. You can also get it off the Uber Mat by simply picking up the mat and moving that (see the photo further up), but that will also cause other decals to come loose. If you weren't done yet with those, and want to stamp on them, your stamper will pick up the unfinished decal instead of transferring the design. I use the flat end of an orangewood stick (lots for little on eBay!). • You can remove the slight curve in the Uber Mat that appeared after using polish on it, simply by rubbing it a little. I found that wiping the remains off with a cottonpad with remover, in a circular motion, was enough already to make it straight again. On a side note, it seems that the more polish you apply at once (thick layers), the bigger the curve. • If you have a polish that stains your stamperhead, it might do the same with the Uber Mat. It of course won't affect how the mat works, but if you want to prevent that, test it out on a less obvious spot first. 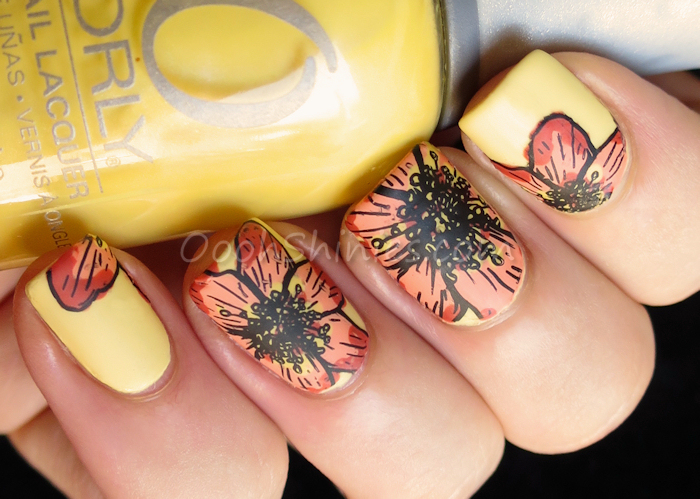 • Stamp fairly slow, so you give the design time to transfer to the top coat on the mat. If you just press down quickly and ligt up the stamper straight away, you might pick up the decal. • Decal application tip: lick your finger! Yes, you read that correct, haha. You see, if you smudge your polish before it's fully dry, licking your finger and gently rubbing over the smudge with that finger, can fix that for you (don't make the mistake of directly licking the smudged polish on your nail, heh). So I started licking my finger for the application of decals as well. You easier slide over your nail, so there's less chance of rubbing a little too hard and damaging the decal, and if you hit a bit of the top coat that's on the remaining part of the nail (where you don't have a piece of the decal), it won't matter either. This helps me a lot to give those pesky airbubbles (that can appear underneath the decal) no chance! • Another thing you can do to prevent airbubbles, is apply a thin coat of your basecolor over the finished decal while it's still on the mat. Then apply some basecolor to your nails and stick them on. If there's any airbubbles, they won't be visible through the colored background of the decal. • If you want to make a bunch of decals and use them a bit later, put the mat on something hard (like a cutting board perhaps). After creating the decals, you can just put the whole thing aside until you're ready to use the decals. I have tried using decals that I created the day before, which worked fine with the Uber Mat (this didn't work as well when I tried it with oven paper quite some time ago, they got too fragile), although they do get a bit harder, which can make the application a bit more tricky. • To get a smooth finish on the decal, you can either use a matte top coat (if you have uneven areas thanks to all the coloring, it won't really show when it's mattified) or use a ridge filler on top of the decal. That'll help to create a smooth result, without needing several layers of top coat. If you just want to protect your desk and aren't into nail art, I think there are cheaper options that can work just as well for you. However, if you do like nail art, and especially (stamping) decals and reversed stampings, this really is a great invention for you! If you were put off from trying such things because it's so time consuming with just a stamper, really, give this Uber Mat a go :) It's so much fun, and offers a whole new level to stamping! 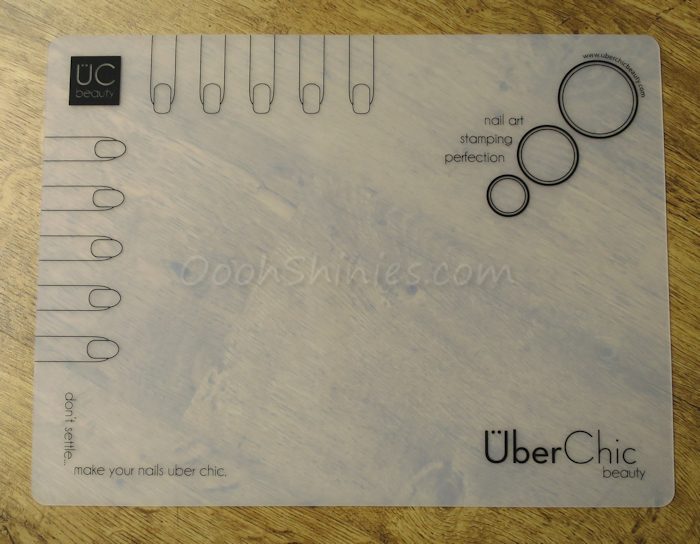 The UberChic Beauty Uber Mat can be bought at the UCB webshop, however, it's currently out of stock (and no wonder!). If you sign up for their emails, you'll also read when it's back again! The Uber Mat costs $14.99. Sinful Colors Unicorn with decals made of Konad Black, Orly Spark, China Glaze Peachy Keen, Catrice I Am A Lob-Star and UberChic Beauty plate UC4-01, with Dance Legend Top Satin. Reversed stamping with lots of colors!